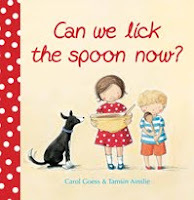 Buzz Words: Can we lick the spoon now? Can we lick the spoon now? WARNING! Reading this book will induce uncontrollable chocolate cravings! When two bored children (and baby) ask: ‘What can we do now?’ (a question that strikes dread into the hearts of many a weary mother), Mum, in her infinite wisdom, says: “‘Let’s bake a cake!’” And so begins a worthwhile, if not somewhat frantic, endeavour enjoyed by all—even Mum. “In goes the butter. Beat beat beat. In goes the sugar. Whip whip whip. Finally, of course, everyone gets to lick the spoon. Then while Mum and kids are waiting for the icing to set, a sneaky someone eats the cake! There’s nothing left to do but start over. There are few activities kids love more than making—and eating—cake. By creating a story around this popular activity, Goess demonstrates the organisation and skill needed to complete such a task. Her use of rhythm and repetition sets the perfect pace for the action, giving the story a sense of rushing towards something. When it’s revealed that something isn’t the expected feast, but the cake’s disappearance, readers are sure to be surprised. But once the story is over and little hands thumb back through the pages, the cake thief’s intention becomes clear. Ainslie’s illustrations are deceptively simple, yet detailed enough to infuse kids with a sense of familiarity and warmth. While the colours she has chosen are generally muted, splashes of bold red, blue and inky black draw the eye. Other books she has illustrated are: One Sheep, Two Sheep by Patricia Byers (Little Hare), The ABC Book of Lullabies (ABC Books) and Little Dog by Katrina Germein (Scholastic). As noted at the start of this review, this title really ought to come with a warning sticker. The inclusion then of a chocolate cake recipe on the endpaper is truly inspired. I haven’t yet put this recipe to the test, but can say with confidence that given that the ingredients list includes 200g of melted chocolate, I am certain it will be a hit. Jenny Mounfield is the author of three novels for kids, her most recent title being: The Ice-cream Man (Ford St). She has been reviewing for Buzz Words since ’06.